In a large bowl, sift the flour, sugar, baking soda, cinnamon, ginger and cloves together. Add the vanilla, bourbon, eggs and olive oil and mix to combine with an electric mixer. Add the carrots, fresh pineapple and coconut and stir by hand to combine. Pour the mixture evenly into three cake pans. When ready to frost, remove the parchment paper from each layer. Frost between layers and on top of the cake. This frosting is very rich, so I prefer not to frost the sides of the cake. 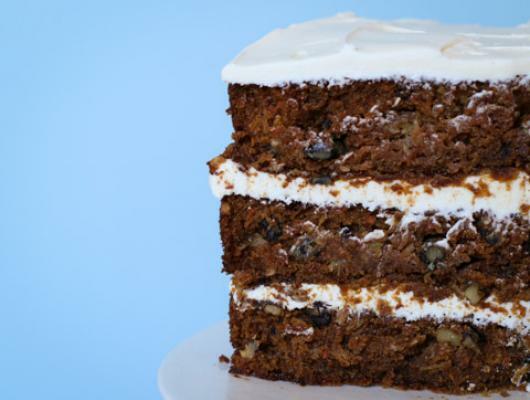 This recipe was inspired by Berta's carrot cake, published in The New Basics cookbook by Julee Rosso and Sheila Lukins back in the 80's. I start with Berta’s recipe, and amp it up for an adult palate. I use fresh pineapple, olive oil, coconut, lots of spices and a big shot of bourbon. The end result is a super moist, spicy, not-too-sweet cake, frosted with my favorite cream cheese and butter frosting. 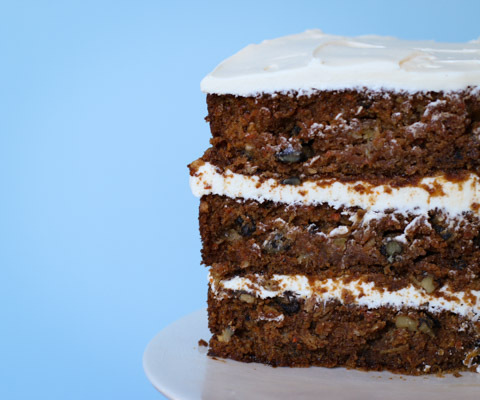 This is a huge 3-layer cake that serves 16 or more and is perfect for a big Easter dinner.